Muslimedianews.com ~ The Mangli's Islamic boarding school (pesantren) is one of the unique and interesting educational institutions in Indonesia. Several national great scholars were graduated from the school. The history of this sufism oriented school is not far from the figure of the founder who has a lot of wonders to be respectful by surrounding society. Based on the [sufism] stories circulating in the community, KH Hasan Ash'ari or better known as Mbah Mangli, believed by them, could attend several teaching assemblies in different places at once at the same time. He could attend a lecture in Mangli, but at the same time also teaching Koran in Semarang, Wonosobo, Jakarta, and even Sumatra. He also did not require loud speaker as per other clerics. In fact, students or worshipper who attends each lectures of Mbah Mangli reach tens of thousands of people. According to Mangli village elder, Mbah Anwar (75), resident of Mangli respect Mbah Mangli figure. Even, despite having died in 2007, the name of Mbah Mangli remains popular. Every day hundreds of mourners from various areas thronged the tomb that is located within the pesantren complex. Mbah Mangli preaches Islam on the slopes of Merapi - Merbabu - Andong and Telomoyo. 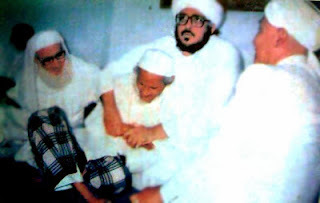 He is also the Murshid of Tariqat Qadiriyah Naqsyabandiyah. It was he who managed to introduce Islam in the area that used to be the headquarters of robbers and thieves. At that time, the area controlled by the famous robber gang named Merapi Merbabu Compleks (MMC). "He has a very tough challenge. The robber cleared farmland and contaminate residents springs lodge. Residents of Mangli were not practical Muslim despite being a Muslim. Most of our residents only Muslim by ID," Chief of Mangli village, Suprihadi Hamlet said. Mangli located right on the slopes of Mount Andong. With an altitude of 1,200 above sea level, that made the school the highest pesantrens located in land of Central Java. From the terrace of the mosque, the students could see clearly the expanse of houses in the city of Magelang and Temanggung. More interesting sights could be seen on the evening where the sea lights decorate the night. To go to this location, we have to travel about 40 kilometers from the capital city of Magelang regency, Mungkid. 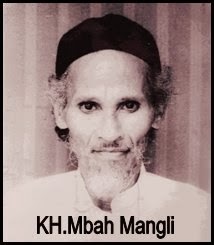 In particular, Mbah Mangli educates his students in a modest pesantren. The place where the school located then known as Mangli village located on the border of Ngablak Grabag District, approximately 25 kilometers northeast of Magelang. With a wise attitude, Mbah Mangli shows that he is not against various threats and disruption of the robber. Instead, he prayed for them to gain happiness and guidance from Allah SWT. His sincerity, simplicity, and persona that took Mbah Mangli close to former Vice President Adam Malik and other great figures. More than that, Mbah Mangli was also actively proselytizing and preaching Islam to audience in various regions. In Mejing village, subdistrict of Candimulyo, Mbah Mangli hold regular lectures located in a Langgar (small mosque) or Surau known as Langgar Linggan. Various groups of Muslims flocked to listen to the counsel and advice of the charismatic cleric with great solemnity. His religious lecture in the past has been almost without a touch of sophisticated technology like today. Instead of recording equipment and photographic documentation, even loud speaker was still rare. Although, with no loudspeakers, all the audience (jamaah), who are [actively] present to study, either in a mosque or in an open field, can always hear the tausiah of Mbah Mangli with clear and bright voice. Even the number of audience were hundreds, or thousands of people, from various positions, all can hear Mbah Mangli voice.